NOTE: I’m now taking international orders. Here’s how it works: After you place your order and pay via Pay Pal, I’ll assemble the items, have them weighed and the postage calculated. I will then send you a “Request for Money.” Once you pay the postage, I’ll mail your package. Note: The images here are a bit more saturated than the actual fabrics. But I think you will be delighted with the real thing! I love ombré fabricsthey have so much potential for creating special effects with color. 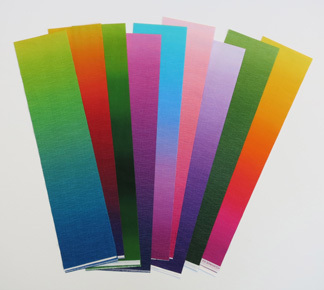 The “Gelato” ombrés from E.E.Schenck come in bright colors, with smooth value and color transitions from light to dark. 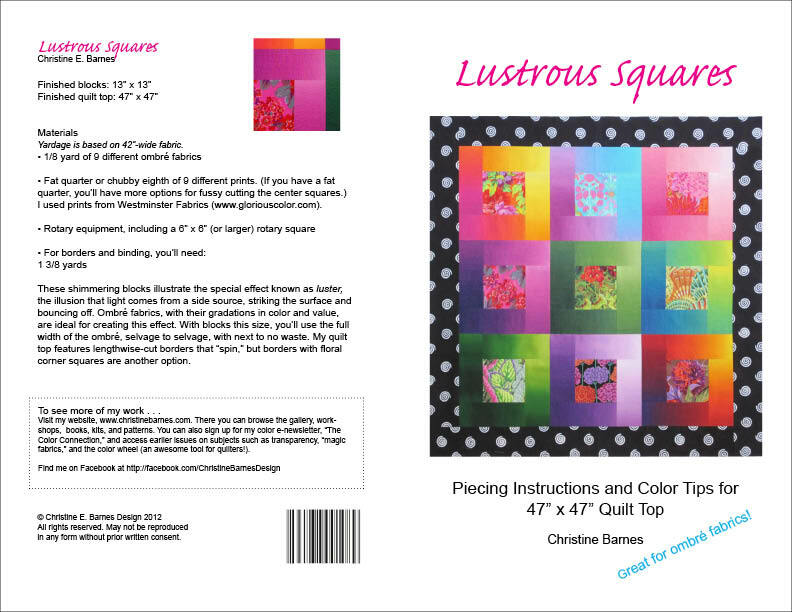 I used these fabrics with Kaffe Fassett prints in my Lustrous Squares quilt. The kit has eleven 5-inch strips of Gelato ombrés (two strips, "marine green" and red, are not pictured). Includes pattern and eleven 5-inch strips (two strips, "marine green" and red, are not pictured). You supply the center and border fabrics. You can buy Gelato, Serenity, and Gradations fabrics in quarter-yard increments, starting with ¼ yard and going up to 2 yards; email me for larger quantities. The following images are of the fabric on the bolt, with the fold to the left and the selvages to the right, to give you an idea of the scale of the color and value shifts. E.E. Schenck has gorgeous new Gelato ombrés that gradate in value only, and they look oh-so-modern. 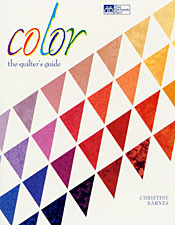 Color: the Quilter's Guide, That Patchwork Place, 1997, 128 pages. 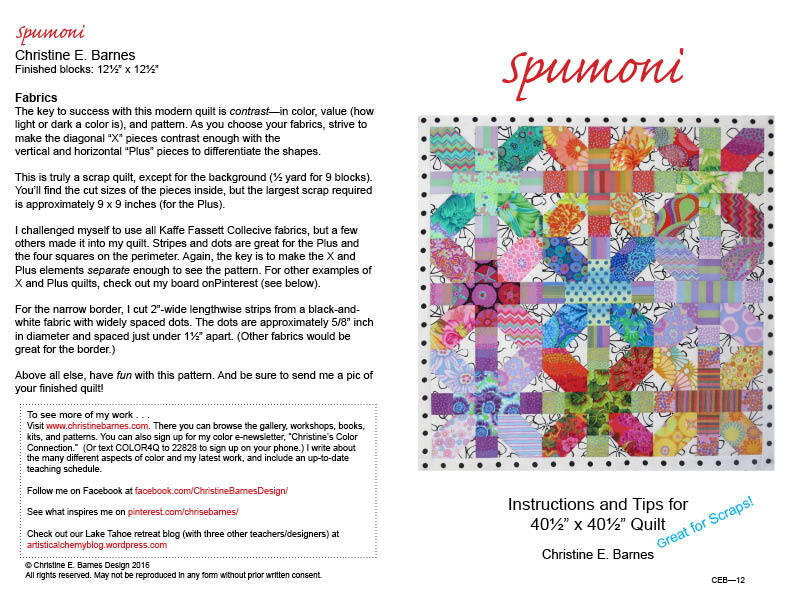 This book covers all the material in my Color Camp workshop, plus much more. Learn to use the language of color - value, temperature, and intensity - and get to know your way around the color wheel, an invaluable tool for all quilters. 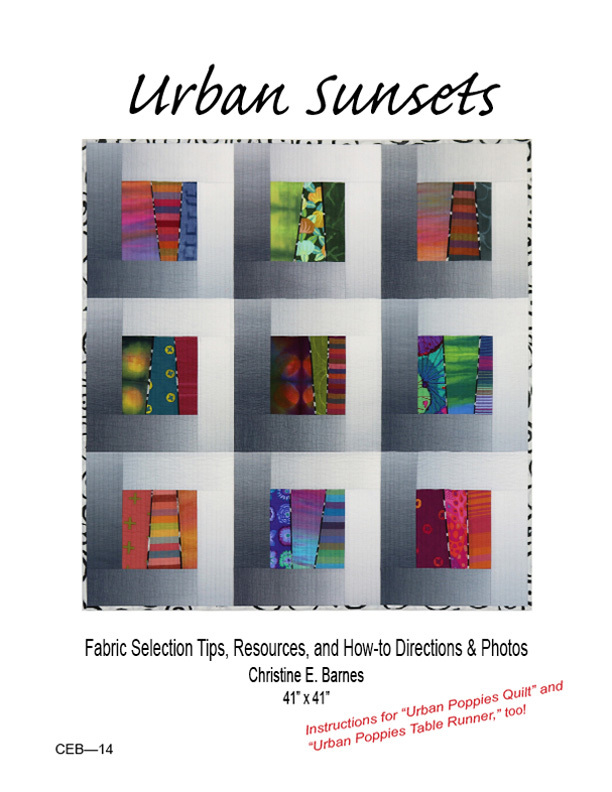 You'll also find a gallery of fabulous quilts, strategies for building color palettes, tips for avoiding the pitfalls, and six quilt projects. 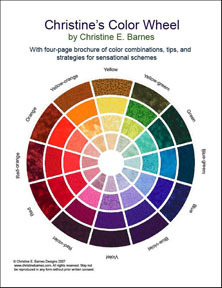 You can usually find this, my first book on color, used on Amazon. 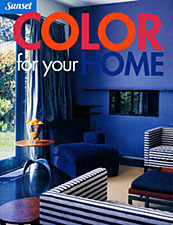 This book offers a step-by-step approach to using color in your home. It begins with Color Basics, simple concepts that allow you to think about and work with color in new ways. 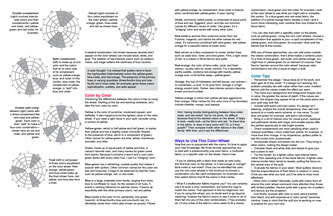 Color Strategies spells out the process for building a color scheme, starting with your givens, gathering and editing your materials, and ending with a cohesive decorating plan. Color Ideas offers a gallery of beautiful rooms in a wide variety of decorating styles. I handpainted the color rings, color swatches, and color palettes used throughout. 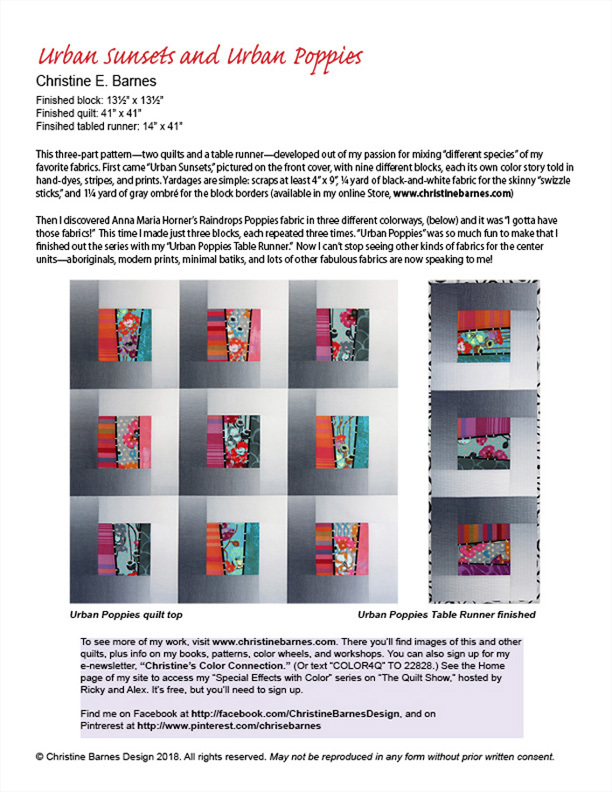 This comprehensive pattern contains the directions for this quilt, as well as my “Urban Poppies Quilt” and “Urban Poppies Table Runner.” Fabric selection guidelines, step-by-step photos, line illustrations, and lots of tips help you create a quilt (or table runner) you love. A card-stock “Preview Window” makes auditioning and trimming the pieced center units easy and fun. Whether you go for nine different blocks, a simplified quilt of three blocks times three, or a fast-and-easy table runner, it’s all here! $15.00 + tax + shipping/handling. Make my modern "Japanese X and Plus" quilt using a collection of favorite fabrics. The options are endless, and the blocks are a snap to make. 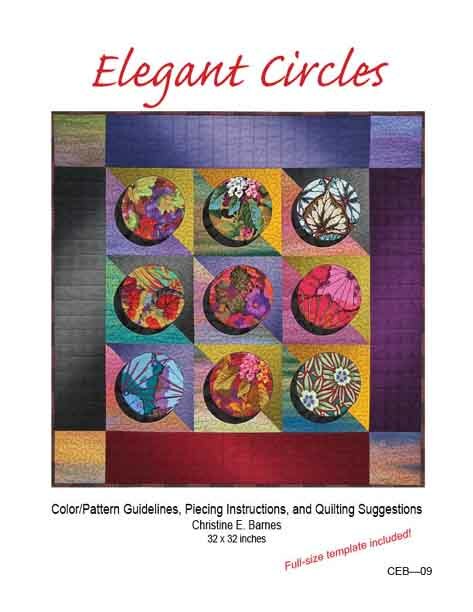 Pattern includes helpful tips for choosing and combining colors and patterns. $10.00 + tax + shipping/handling. This surface-stitched vest with asymmetrical front, collar band, and tie closure provides a great canvas for color and design work. The back of the pattern lists yardages for sizes S-XXXX. In addition to the fabric, you'll need a sewing machine with walking foot, rotary equipment, fine pins, and 5 or 6 spools of various colored threads. Tissue pattern by Simplicity. $9.00 + tax + shipping/handling. 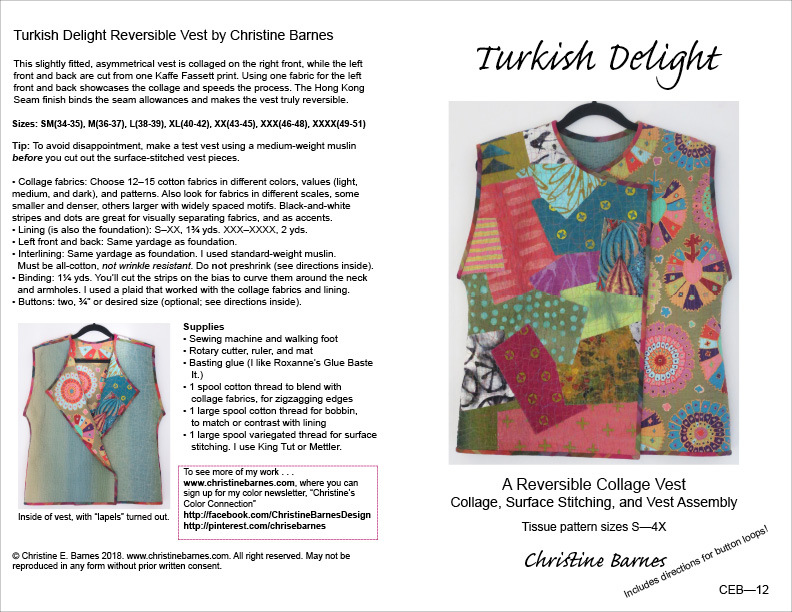 For this overlapping, surface-stitched vest with asymmetrical front, you'll work improv-style to create a one-of-a-kind wearable. Sizes S-XXXX. In addition to the fabric, you'll need rotary equipment, basting glue, and variegated thread (see pattern back for all supplies). 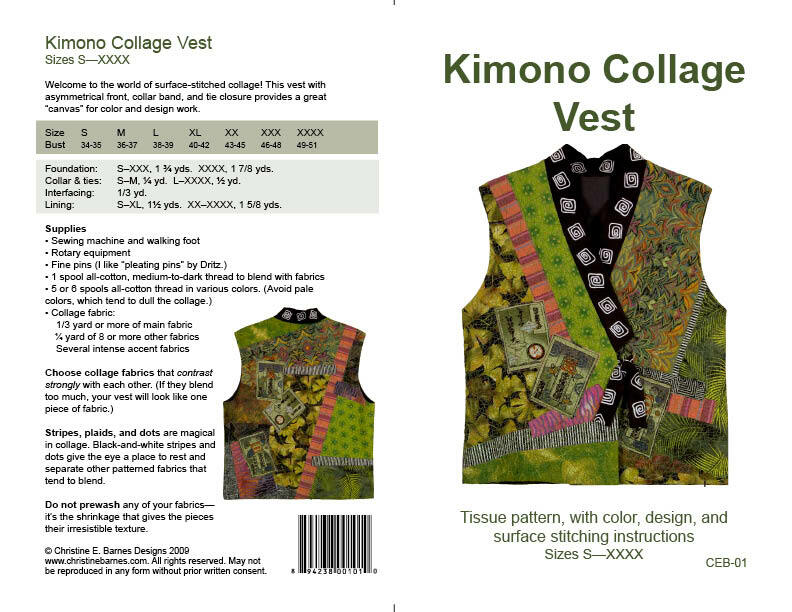 This slightly fitted, asymmetrical vest is collaged on the right front, while the left front and back are cut from a Kaffe Fassett print. 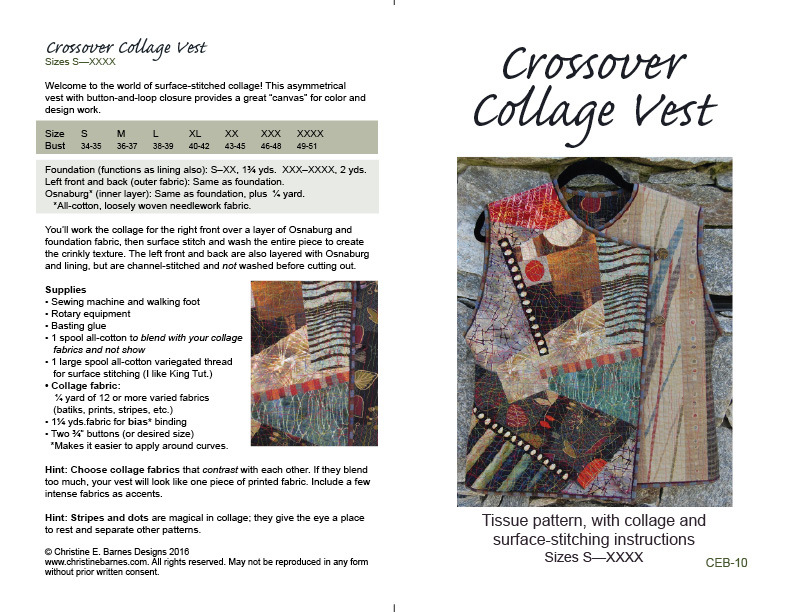 Using one fabric for the left front and back sets off the collage and makes constructing the vest easer and faster. The Hong Kong Seam technique binds the seam allowances, making the vest reversible. 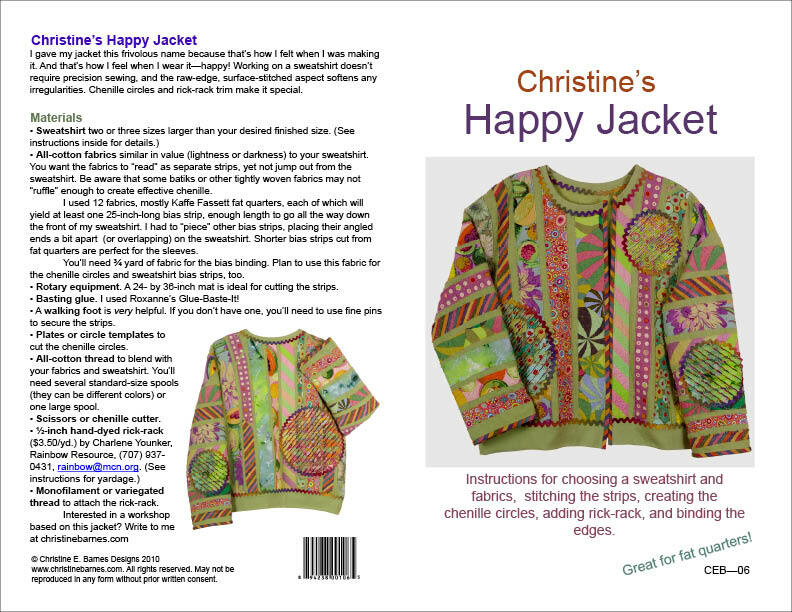 Pattern includes sizes SmallXXXX, with tips on fabric selection and directions for adding button loops. This easy-to-make new pattern is based on a traditional block called, paradoxically, “Antique Modern Block.” I added an element of transparency in the gray-and-batik units in the corners of each block, as if those fabrics are layered and transparent. Large setting stones and wide sashing air out the design. The graphic impact of this shadowed-circle quilt is the result of contrasts in value, color, visual texture, and pattern. 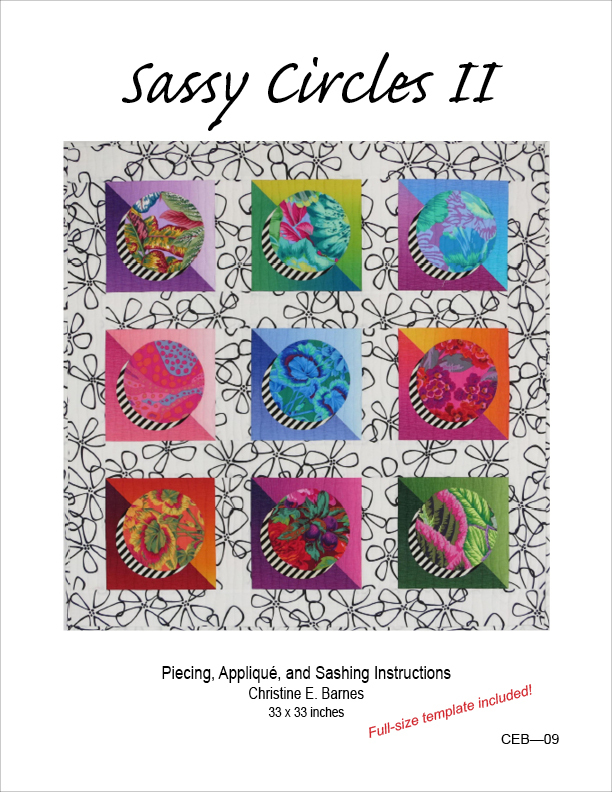 You’ll learn how to isolate areas of your fabrics, iron-baste the circles to freezer paper, and create the shadows that give the design a sense of depth and volume. Includes a full-size, card-stock template. I gave my jacket this lighthearted name because thats how I felt when I was making it: happy! Youll need a sweatshirt two sizes larger than you would normally wear, because the surface stitching significantly shrinks the sweatshirt fabric. Choose a variety of fat quarters and a special trim for the chenille circles. See the pattern back for a complete description and supply list. 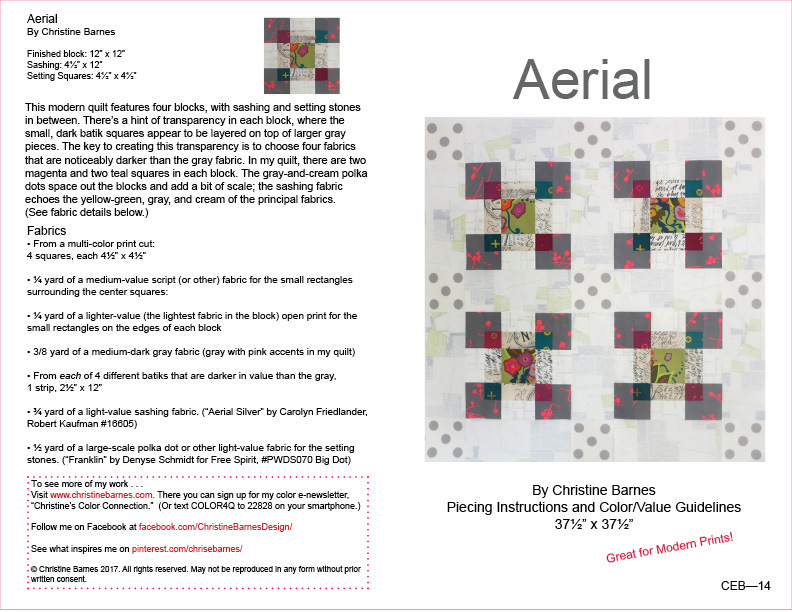 Learn to attach strips around the center squares to take advantage of the value and color changes in ombré fabrics. The borders spin too, making this a super-simple pattern. Triangle paper and a row-by-row construction make this quilt suitable for all skill levels. This pattern includes specific fabric guidelines, but you can use other types of fabrics, as long as they are the values listed. This complex-looking quilt is surprisingly easy to make: you sew “basic blocks” consisting of one center fabric and strips of another fabric to surround the center, then “whack” the blocks off-center and reconfigure the units. 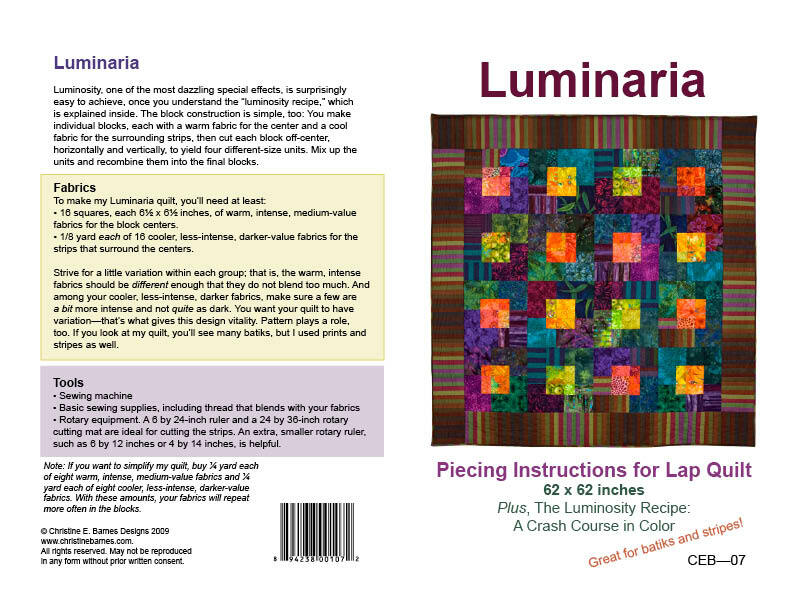 Follow the “luminosity” recipe, explained in the directions, to create a quilt that glows. 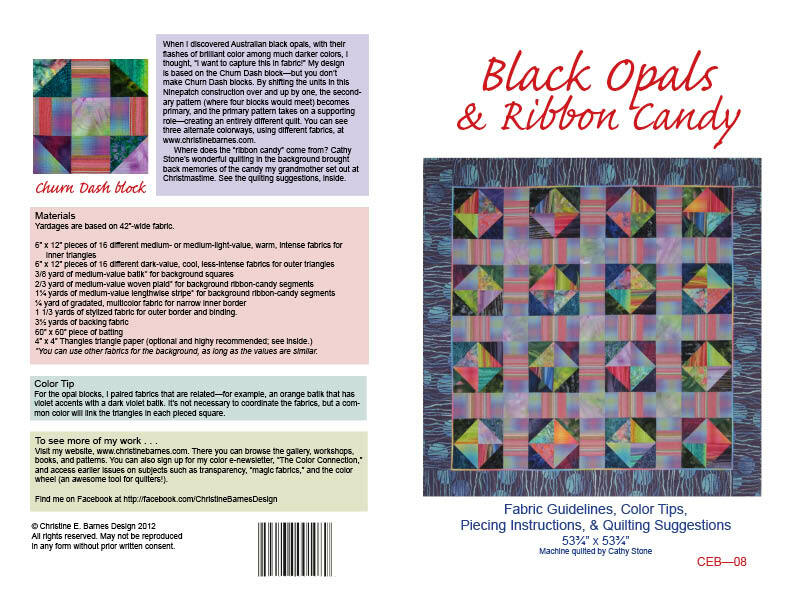 I've had a wonderful response to the color wheel I use in my workshops, and it's now available to quilters. 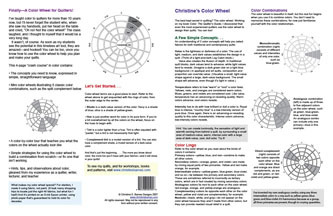 My wheel includes an 8 1/2 x 11-inch version of my fabric color wheel (printed on the highest quality luster paper), plus a 4-page brochure of color concepts, combinations (split complementary, analogous, triadic, to name a few), tips, and strategies for traditional and contemporary quilters.